Year one students of the Draiba Primary School Esther Navara and Lavenia Raditora during the start of the 2015 school year. PHOTO JONA KONATACI. Cabinet has approved the removal of scaling of marks for the Fiji Year 12 and Fiji Year 13 Certificate Examinations, effective from this year. Cabinet based its decision on a submission by the Minister for Education, Heritage and Arts, Mahendra Reddy. Scaling is a fundamental process used to convert scores to a common scale which adjusts the results students achieve in their various subjects. This is for the purpose of aggregation, ranking and selection for entry to universities or other tertiary institutions and scholarships award. 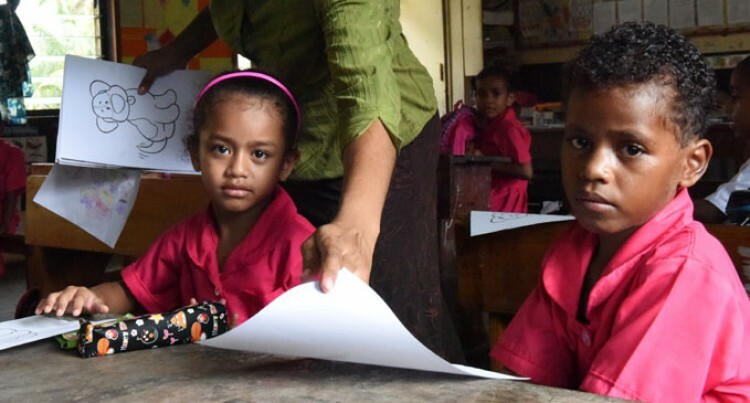 The scaling system was introduced in 1979 for the Fiji Seventh Form Certificate Examination and in 1989 for Fiji School Leaving Certificate Examination as a principled method of addressing subject equivalence. Mr Reddy said despite the good rationales for scaling, scaling conceals the raw marks and does not reflect students’ true achievement. He said that with the removal of scaling from external examinations, the syllabi from Year 1 – 13 would be revised and standardised with specific learning outcomes. The internal assessment components will be strengthened in all subjects and moderated internally in schools with strong emphasis on teaching and revision. He said Year 10 national examination shall be re-introduced and externally prepared final examinations for each subject for Year 6-9 and Year 11 introduced. He said detailed solutions and marking guide for each of the examinations would be revealed later. He also outlined measures to uplift student performance which includes the removal of administrative duties from teachers and directing them to spend all their time on lesson preparation, teaching and revision, specialised and short – term training for teachers, ensuring that schools have adequate resources for enhancing of teaching and learning such as quality class rooms, furniture, adequate amount of stationary and library resources; boosting IT resources and student access to personal IT resources; and identifying below average students in every class and mounting remedial classes for these students in the Schools every day. In addition, he said that emphasis shall also be placed on improving teacher quality in collaboration with teacher training institutions.